The Tattoing of the Tattooer, a photo by mrtoastey on Flickr. Co-creators of The Lexington Tattoo Project Kremena Todorova and Kurt Gohde — neither of whom has any previous experience with tattooing — work on the project's lead tattoo artist, Robert Alleyne… with plenty of guidance and faith! Robert's word? "It"
Nobody could understand. They'd never get it. Your friends don't know, and you? You listen to that record, rocking out, alone in the car, or maybe on headphones and every time you think: I wish somebody understood how great this is. That record (this time) is the self-titled 2000 album by a quartet of wild-eyed ambitious LA kids called Tsar. I came to Tsar by way of my cousin, who was friends with some of the members. The sticker on my promo copy says: "TSAR exhibit all the qualities of what will rescue rock 'n' roll: Anthemic choruses, blasting riffs and an all-important sense of melodic richness rooted in the tradition of classic British Invasion pop, but no doubt fueled by the brash, free-for-all spirit of early punk." Yeah, right. How many part-time PR people have tried to frame their friend's band this way? It was The Year 2000, the dawn of a new millennium, pre-9/11, and thus a pretty good time to be spouting such hyperbole. The thing is, though? Tsar's first record sounds kind of exactly like that — almost heartbreakingly so.. Once, sometime after embracing my immediate love of the album, I was raving to my cousin about its greatness, its ROCKness, and I let slip a personal predilection I'd been smugly hiding: "They're joking, right?" I gushed to him, and was immediately sorry, because — in his pause over the phone — I could hear the sting. "No, I don't think they're joking…" he too quietly replied. It's happened this way for years: The itch starts and must be scratched. After a week or so of top-decibel car jamming, the TSAR cd goes back into the collection its appeal waning for a time. But after more than a decade, I can tell you that it always comes back out, the dream re-ignited by something or another in my boring non-rock life. And when it does, that same feeling comes over me again. "I wish somebody got this." I make up that's silly "it's like" statements in my head and my latest: It's like Rick Springfield convinced Kiss to be the Bay City Rollers. And yes: that's a compliment. 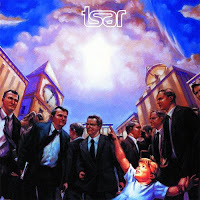 I hope rock-n-roll always needs saving and always has room for saviors like Tsar. Even if people don't realize they're being saved.